What happens when a card is full? Once your Loyalty Card is in your customer's phone you'll never need to spend time or money promoting or distributing your card again. 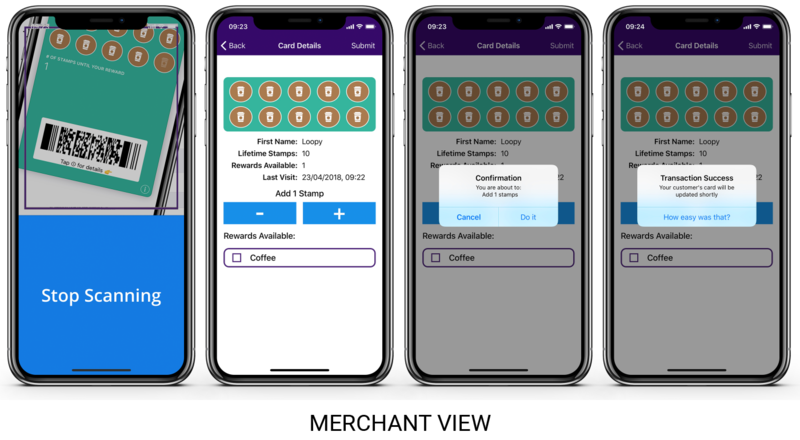 Once your customer has added your Loyalty Card to their mobile wallet application, their card will update - even when they have completed their card. When they have completed their card it will automatically go back to zero, while showing the reward(s) they have collected. This means you never have to spend time or money promoting your loyalty program to this customer again. In this article we describe, and show, what happens when a customer 'completes' their digital Loyalty Reward card. Your customer has 1 more stamp until the card is complete as shown in the example image below. The card shows 9 stamps and no rewards. 2. Your customer makes a purchase (in this example, buys a coffee) and you scan their card as normal. And then tap the + button to give them 1 stamp, tap on submit and confirm you want to give the customer 1 stamp by tapping 'Do it'. Tapping 'How easy was that?' takes you back to the scanning screen. 3. Your customers card is automatically updated to show they have completed their card and that they have earnt a reward. 4. When the same customer comes to visit you again, you scan the card as normal and you will see that they have a reward available. 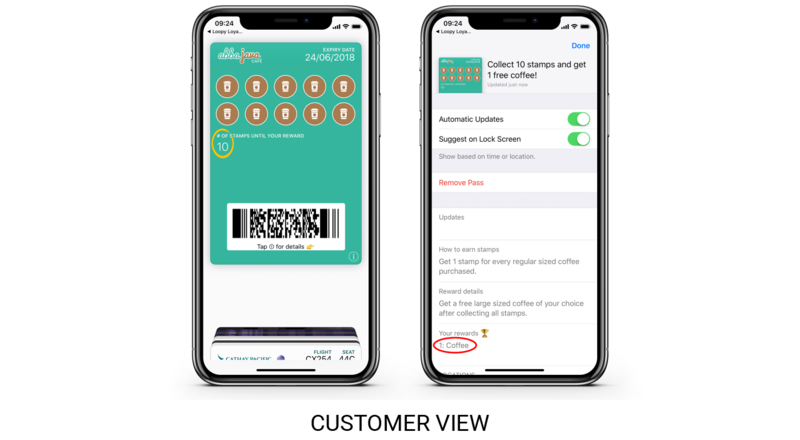 If they choose to redeem the reward you give them their reward (in this case a free coffee) and then simply tap on the reward they've received, tap 'Submit' and 'Do it' as final confirmation. 5. The customer card automatically updates. The customer will instantly see a fresh card and that they no longer have a reward available. They will now start collecting stamps again. Once your customer has your Loyalty Card in their phone you never have to promote or distribute your card again. Your customer has a 'forever loyalty card' that automatically 'starts again' every time they complete the card. The above example shows a customer choosing to redeem their reward at the time of completing their card. If they don't want to collect their reward at this time, then the reward will still be shown on the card, and available, until such time they choose to redeem the reward. The above example and images show a single reward card type. 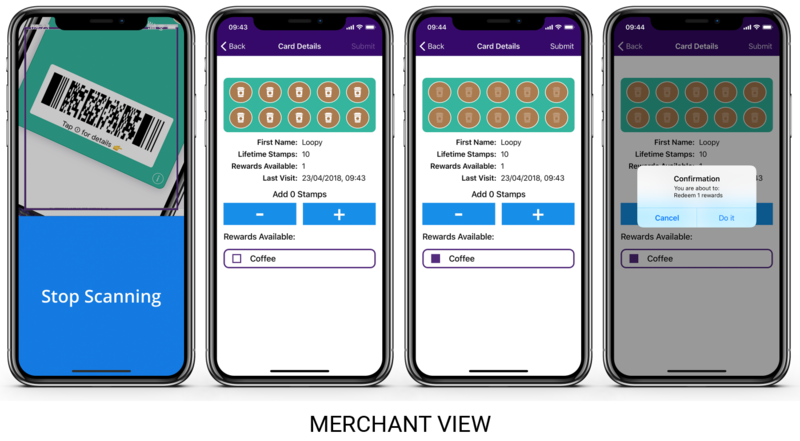 For multiple reward card types, your customers will collect rewards as they complete their card (e.g. at stamp 4, stamp 6, and stamp 10). These rewards will show on their card, and when you scan their card.